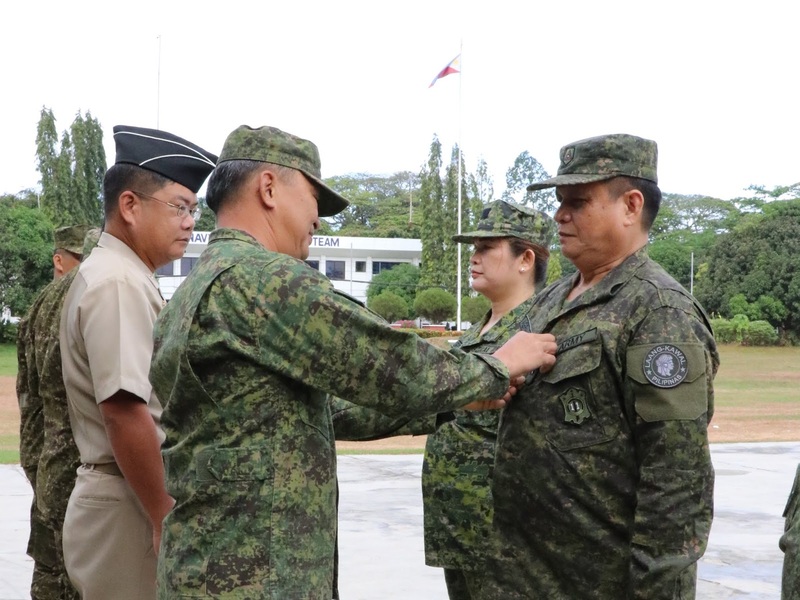 NSFA, Panacan, Davao City - Lt. General Felimon T. Santos Jr., Commander of Eastern Mindanao Command (Eastmincom) welcome and donned the rank of newly commissioned Reserve Officers during the flag ceremony at Naval Station Felix Apolinario (NSFA), Panacan, Davao City on March 18, 2019. Director Raymundo G. Agravante, Regional Director of DOLE XI and Dr. Mary Christine R. Daligdig, Head District Hospital Davao Occidental led the honorees. They have donned the rank of Lieutenant Colonel. Judge Charles S. Concon of Municipal Trial Court of Maragusan, Atty. Kenneth N. Dabi of the Integrated Bar of the Philippines and Pastor Lazaro Atencio of Harvest Hill Baptist Church have been donned the rank of Major. Dr. Alejandro C. Rodriguez of Tagum Doctors Hospital and Dr. Shera L. Elefante of Southern Philippines Medical Center have donned the Captain rank and Allan G. Sacopayo of Multi-Test Diagnostic Center donned the 2nd Lieutenant rank. The newly commissioned officers' expertise, skills, and talent will be tapped in the different peace and security efforts, organizational transformation initiatives and humanitarian assistance operations of Eastmincom and the Armed Forces of the Philippines. "The organization is grateful for having you as reservist whose qualities are highly needed, professionals who put a premium on national interest and well-being of the people," Lt. Gen. Santos Jr. said in his message during the ceremony. The donning was capped with a parade in their honor and witnessed by their families and friends, officers from Eastmincom and other units in NSFA.